The Guigal firm was founded by Etienne Guigal in 1946 after 15 years at Vidal Fleury. Son Marcel has led the firm since 1961, and his unparalleled work ethic and dedication to quality have lifted the Guigal wines to the pinnacle of the wine world, and the Guigal domaine to its status as the leading winery from the Rhone Valley. Today, Marcel’s son Philippe serves as Director and Oenologist at Guigal, and with his father is carrying on the tradition of leadership in the Rhone Valley and uncompromising excellence. A second important dimension is Guigal’s approach to viticulture. The Guigal family is tireless in its work on the steeply sloped, terraced vineyards it owns, with views entirely to the long-term. Their philosophy in the vineyard is to prune low and strictly limit the number of shoots per vine, training for low vigor and low-yields and looking for natural balance and concentration in this manner. No pesticides, herbicides or chemicals are used in the vineyards. Thirdly, Guigal is a unique negociant company. The family knows the Northern Rhone like no one else, and supplements their holdings by buying grapes from long-time grower partners. In total, they vinify around 33% of Côte-Rôtie and 45% of Condrieu, and have access to top fruit in all the regions they work. In the Southern Rhone, they buy only wine, and with a distinctive approach. Namely, they do not have a single contract. Marcel and Philippe taste relentlessly and start from scratch every year. 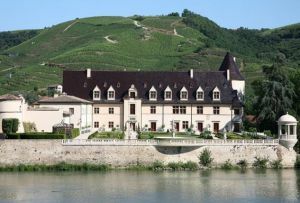 In a given year, they will purchase the top 1% of the wines they taste, and because of their longtime contacts, they have access to the best wines in the region; they select, in other words, 1% from the very finest wines in the Southern Rhone. Fourthly, Guigal’s vinfication is singular in the world of wine, and allows their great raw materials to flourish in the bottle. Their vinification approach actually harkens back to tradition in the Rhone Valley, with long ageing, which integrates tannins and flavors and creates wines of great complexity and refinement. Because of their superior fruit, the Guigals do not make “simple” wines – these wines demand time to come together. All wines undergo natural yeast fermentations, and intervention is at a bare minimum, with no fining or filtration. The top Guigal wines undergo famously long maturation period in barrel, up to three and a half years, but even parcels of old-vine Syrah for their Côtes du Rhône are aged in foudres for six months, completely atypical for the Côtes du Rhône category. The reality is that it is enormously expensive to hold onto 3 or 4 vintages of Chateauneuf-du-Pape or Côte-Rôtie, or even to hold onto Côtes du Rhône that is two or three vintages behind what other producers are releasing, but it is done for the quality of the wine, and so that consumers can enjoy the wines for drinking upon release.